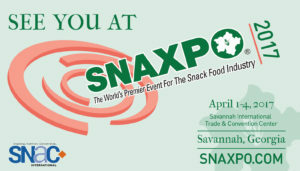 Anyone in the food industry will be present in Savannah GA the first week in April for the 80th annual SNAXPO Conference! SNAXPO is the world’s largest, most comprehensive trade show devoted exclusively to the international snack food industry, where attendees can discover new and innovative equipment, ingredients, products, and services available to grow and enhance your business. MoistTech Corp.™ can be found in BOOTH 302 performing live demonstrations with our IR3000F Grade sensor showing how easily and accurately our technology can improve your product.